If a picture is worth a thousand words, then the photographer behind it must be worth infinitely more. Think for a moment of your favorite photos - which ones made you laugh, made you cry, surprised you, or delighted you? It takes an artist with incredible dedication to their craft to capture these moments and memories and through them to create a story. Katherine Callahan (Katherine Elizabeth Photography) is a wedding and portrait photographer who simultaneously creates a story while making you feel like you are chatting with a friend. When we met in 2016 she was working at a non-profit and photographing weddings, families and portraits on the weekends. As of early 2017 she is a full-time photographer, shooting 15-20 weddings a year in the greater Baltimore and DC region. Her work is full of intimate moments on some of the most important days of people’s lives. It’s a summer Sunday morning, the sky is clear and the sun has not yet reached its hottest point of the day. People are walking their dogs, jogging, and crabbing along the Canton Waterfront in southeast Baltimore. 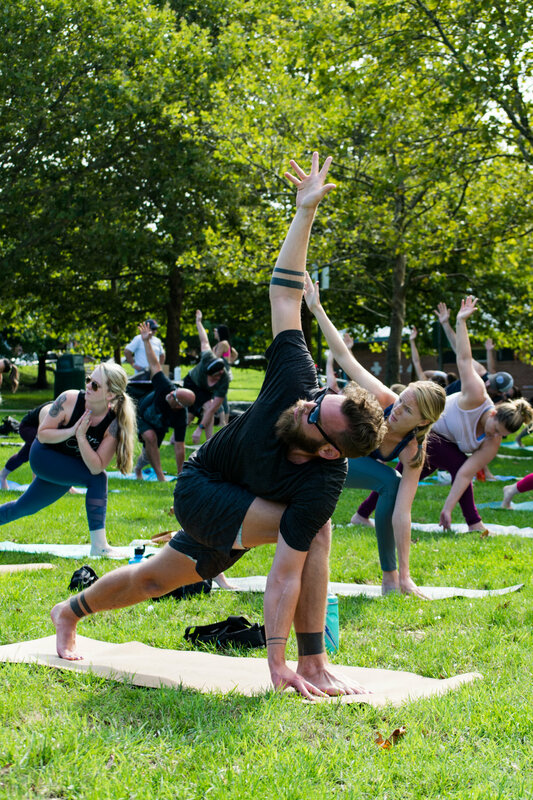 Nearby on the grass, nearly 100 people have laid out yoga mats and have begun a harmonious flow, shifting and transitioning from mountain to cobra to down dog to warrior and back. All ages participate, from kids to seniors, and sometimes a few dogs. A woman glides between them all, calling out poses and leading the sequence. The wind rustles the sycamore leaves and passers turn to watch and sometimes join in. It’s one of my favorite parts of summer - exercising my body and mind while connecting to the outdoors just a short walk from my home. 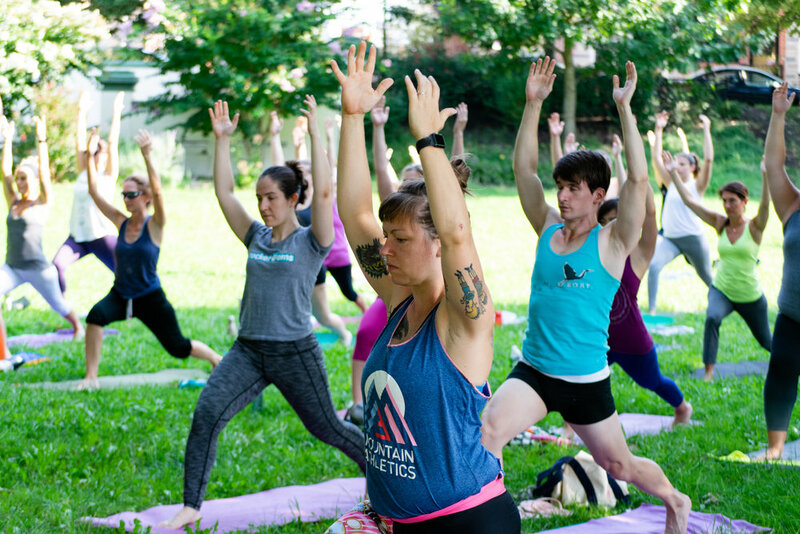 This is Pop Up Yoga Baltimore, a pay-what-you-can yoga company that makes yoga accessible in parks around the city. It began 4 summers ago by 5 women searching for a way to help them grow as teachers while undergoing their 200-hour yoga teacher training. Cathrin, Lisa, Kyle, Rebecca and Jessica met at YogaWorks and decided that the best way to grow would be to create their own opportunities. 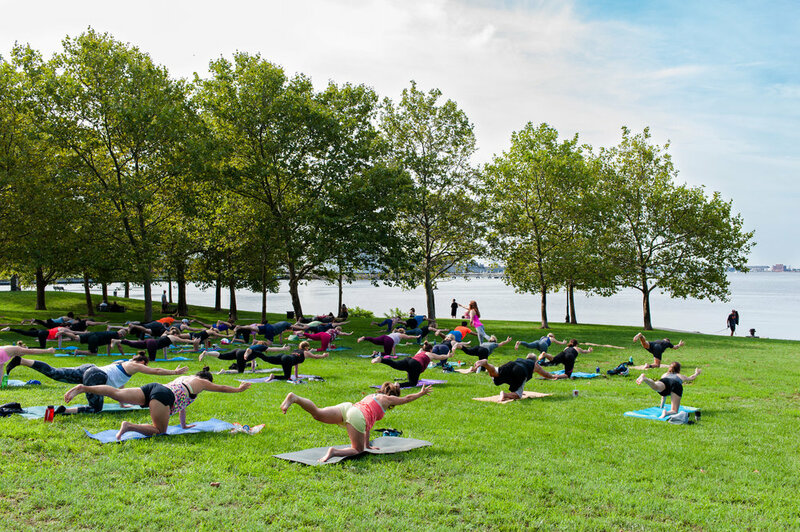 They brainstormed ideas about how to hold free classes and decided on using public, outdoor spaces, holding their first class in May 2015 in Canton Waterfront Park with 40 people. Today, they have reached thousands through their weekly summer classes and special events and average around 100 people per class. They’ve also started mixing up their locations, utilizing Patterson Park to the north of Canton, and Latrobe Park in Locust Point. 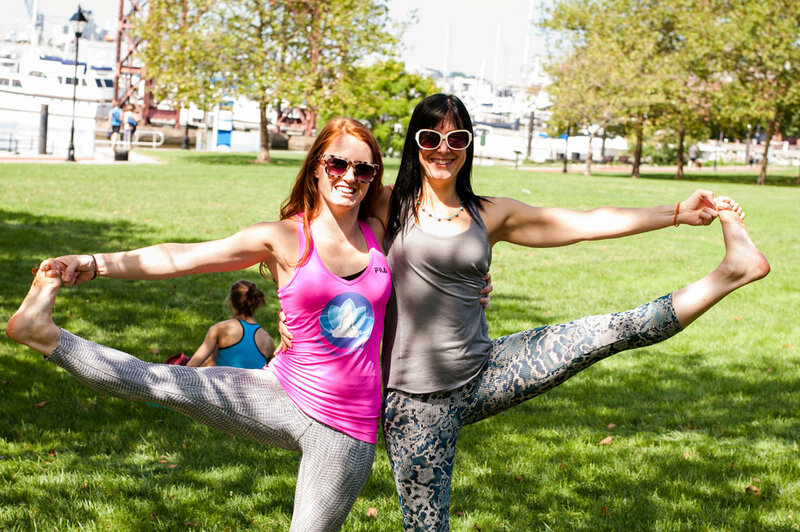 Connected by a love of yoga and giving back to their community, the women of PUYB are all quite different. Lisa Palumbo was a high school English teacher for over a decade before becoming a stay at home mom. She is a certified Barre teacher in addition to yoga, and is working on her BUTI yoga certification. Cathrin O’Donnell is the General Council for a locally based short line freight railroad. She discovered yoga during law school as a positive way to reduce stress and fell in love with the mental and spiritual aspects it offers in addition to the physical practice. Kyle Shay was looking for a way to stay in shape that was different from jogging or working out by herself at a gym. She found yoga and fell in love. After 16+ years in IT project management, Kyle now teaches yoga at BambooMoves, while also working full time in Real Estate. Jessica Knott can be found doing one of many things on any given day. She works for a clinical research company doing writing and communications and supports BodyWise Foundation, a local nonprofit which provides free yoga classes to those who have been impacted by trauma. She also teaches yoga, offers reiki sessions and leads meditation. Rebecca Horner came to the 200-hour yoga teacher training through her love of helping others heal. She is an MSW student at University of Maryland and a Camp Director for Camp St. Vincent, a program for children experiencing homelessness. Her personal practice is a key part of self-care, and her teaching helps to connect vulnerable populations with the healing benefits of yoga. With so much diversity in work and expertise, it’s no wonder they start planning their year in January! Classes are offered primarily in June - September, yet the work begins far before that. The City of Baltimore requires permits be purchased for each class and event so the requests need to begin early. The cost varies - there’s a fixed fee plus a variable rate that depends on the weekend, the park, and the estimated number of attendees, which the group estimates based on the previous year’s sign-in sheets. Since the city parks are high in demand for activities, it is often unknown which, if any, park can be reserved until May. The total cost just for permits is $3-4,000 a year and is the bulk of the expense for PUYB, paid for by a combination of class donations and, when necessary, the teachers’ own pockets. Once the dates and locations are confirmed, it can take several calls between the group to schedule teachers for each class. “When we first started, it was really important for all of us to be there, to promote and be a part of it,” says Jessica. “We also all lived nearby so it was pretty easy to get to Canton. As our lives have changed, that’s not possible anymore.” Now 3 people are assigned to each weekend - one teacher, one assistant, and one “on call” should an emergency arise and a sub is needed. This allows more flexibility and less time commitment. “Four hours, every Sunday morning, from spring to early fall, is a big commitment” says Lisa. They’ve tried to acknowledge that they all encounter personal burnout and that every season has its ebb and flow - they all have intense personal lives and each year someone may not be able to give as much effort. Creating and sticking to a schedule helps with the coordination of maintaining the group. As a small, start up group, it is important to PUYB to work with other small, local businesses to represent all aspects of the yoga and health world and to maintain an inclusive, non-competitive environment. They spend a significant amount of time coordinating sponsors and partners and marketing these relationships alongside their classes. They will generate a list of potential partners at the start of the season and will often have people who have attended classes reach out to them as well. Some partners have included Prosper Wellness, BambooMoves, BELIEVE Life Coaching, M.Power Yoga Studio, Galley Foods, and Lift Yoga + Strength. In addition to the Sunday classes, the group holds around 3 special events a year. These have included Full Moon Yoga, evening Glow Yoga, and Halloween Yoga, complete with costumes. The events include several sponsors, sometimes a raffle and giveaway, and nearly always music from the Herd Brothers at M.Power. All 5 women agreed that their most memorable experience with PUYB was at one of their first Full Moon Evening class where 800 people attended. “It was an incredible feeling, teaching hundreds of yogis wearing glowsticks, howling at the moon, accompanied by live music,” said Cathrin. The women of PUYB aren’t quite sure what their future is yet. Expanding to the Annapolis region is one possibility, as is building on some of the relationships they’ve formed over the past 4 years and perhaps adding more teachers. As they’ve become more well known in the community, other groups have started reaching out to them to get advice and learn how to run their own groups and businesses, something Lisa says is extremely flattering. She also said they are seeing an increase in donations by better explaining where those donations go. Right now they average about $2-3 per person per class and have used that money not only for the permit fees, but for the purchase of microphones and a generator for their larger events, and other regular fees for each class they hold. For now they plan on continuing what they’ve been doing and seeing what opportunities and changes life brings next! Their mission of providing yoga to the community certainly seems to be working. 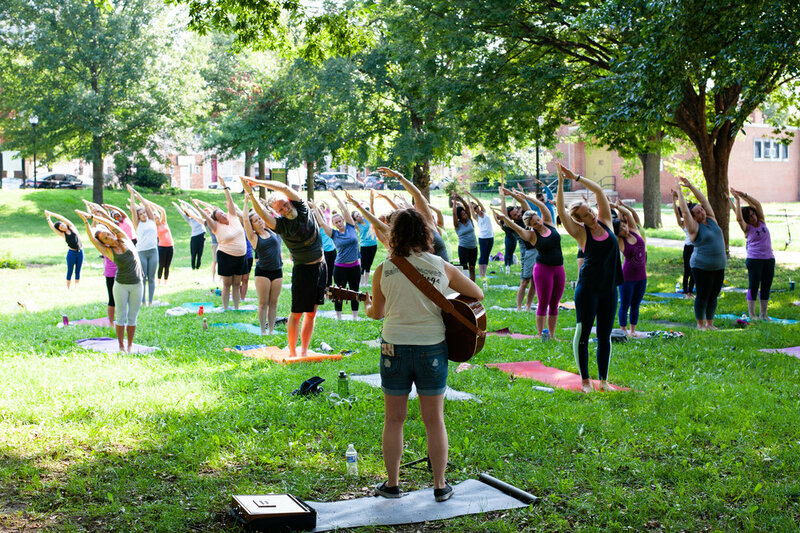 There are many people whose yoga practice is limited to Pop Up Yoga Baltimore classes. With most yoga classes ranging from $7 for community classes to more than $20 at a studio, a pay-what-you-can model is certainly appealing. “I think a lot of people would be surprised by how accessible a yoga class is, especially in the format PUYB teaches. There is a certain mystique around yoga — people think you have to be naturally flexible or in good shape — but the truth is, anyone and everyone can benefit from a regular yoga practice and getting started is just a matter of showing up!” explained Cathrin. Thank you so much to Kyle, Rebecca, Cathrin, Jessica and Lisa and the whole Pop Up Yoga Baltimore community for allowing me to join you! I’ll see you all at class! 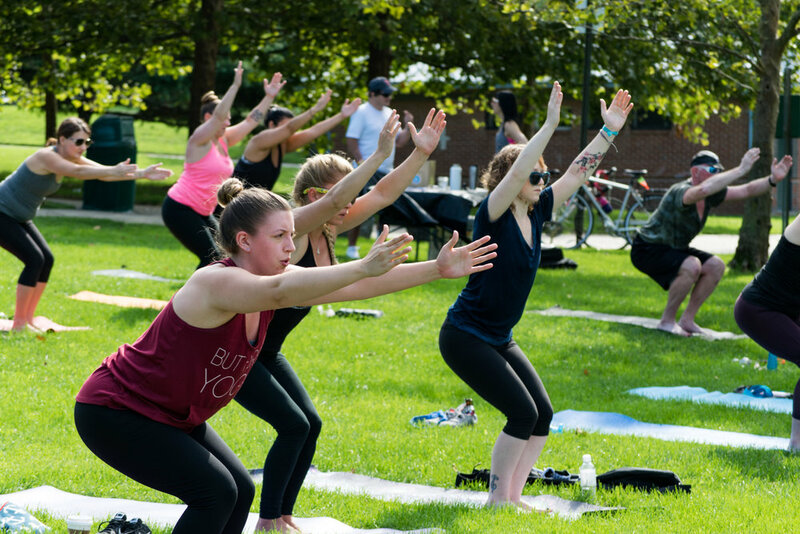 The best way to find out about Pop Up Yoga Baltimore and stay up to date on their events is through Facebook and Instagram. Their next Sunday class is September 16th at 9:30 at Patterson Park. Keep an eye out for a special Halloween Event on October 26th at Canton Waterfront Park! On a Saturday morning in early March, I found myself winding through the basement hallways of a building in Northeast Baltimore, looking for the home of B-More Bags. After several doorways, a simple yellow sign with an arrow told me that I was near my destination.